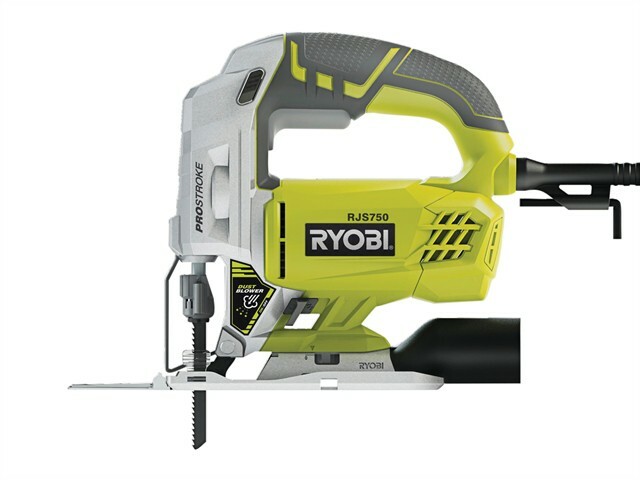 Ryobi RJS750-G Jigsaw offers class leading cutting performance, with improved cut line visibility. It is both compact and slim and features an integrated air management system that blows dust away from the cut path and the user. Has a powerful motor and class leading stroke rate providing the best possible cutting capacities. Offers improved accuracy due to the new flat saw bar design, which offers increased accuracy of up to 49% and reduced vibration of up to 10% versus leading competition. Also fitted with a Line Assist flip down cut guide which provides a guide to help the user follow a marked line, whilst the flush cutting capability helps further to cut an accurate straight line. Its also fitted with Quick Lock, a slim handle design, and a soft rubber grip. Cutting Capacity: Wood: 75mm, Steel: 6mm.